Last week I went to the grocery store, and on a whim, I purchased a cheese ball. It was a gorgeous cheese ball. Port wine cheese, mottled orange and red, pleasingly symmetrical and encrusted with nuts. I’ve never purchased a cheese ball before, and I was excited about it. I was looking forward to trying it, especially since I also got these fancy crackers at Trader Joe’s. And as I was dancing with someone that evening, I mentioned my excitement over the cheese ball. Because apparently that’s what I think of as fabulous dance conversation. “It sounds like you really like cheese,” my partner said. 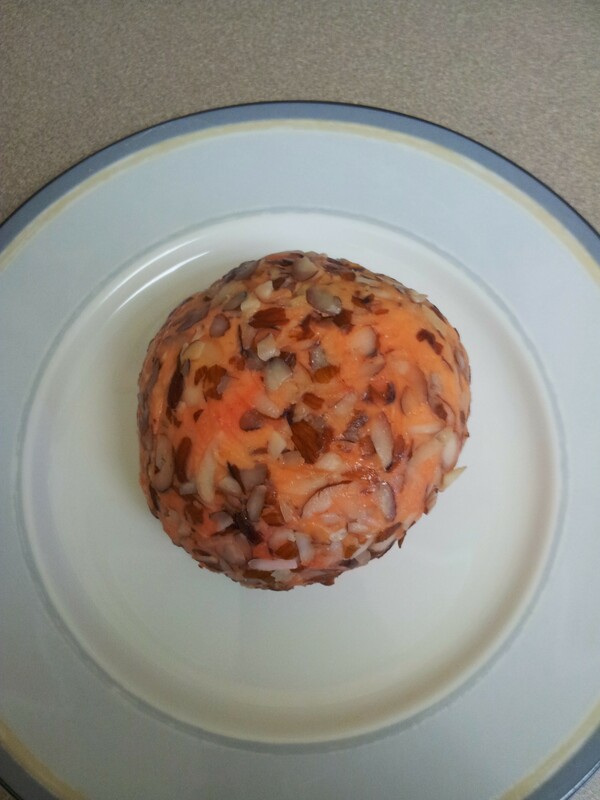 This is the cheese ball in question. The week before, I had not been feeling the dancing. I’d been really sick, and even though I was better and no longer contagious, I was annoyingly weak and easily fatigued, and my center of balance felt off, which for dancing is particularly unfortunate. And then one of my partners told me THREE times while we were dancing how I’d gotten worse at dancing since the last time we’d danced. I tried to laugh it off the first two times, but by the third time I’d lost all patience (big surprise), so then I was not only tired and weak but also irritated. Not the best night. I went home early and watched Star Trek instead. And then the next week, I took a lesson before the free dancing period, and I was completely lost for pretty much the entire hour. I was supposed to be learning both how to lead and follow all these different turns, and I’d never really led before, period, and trying to learn both sides at the same time meant I was learning nothing at all because having my focus divided meant I didn’t have enough focus for either side, plus there simply wasn’t enough repetition for me to get it down. By the end of the lesson, I felt like my brain was oozing out of my ears in goo-like fashion. As I walked off the dance floor afterwards, I realized I had a choice. At that moment, I felt stressed and like a terrible dancer. If I encouraged that feeling, I’d be super tense while I danced, which isn’t good. I’d lose a lot of my connection with my partners, which isn’t good either. And I wouldn’t be having fun, which is definitely not good. Or I could shake it off to the best of my ability, and believe BY FORCE OF WILL that I was going to have an amazing time dancing that night. I could think of all the other amazing times I’d had, and I could think about how much I love dancing, and I could be happy to see my friends and partners, and I could simply do my best and be okay with that. I chose option two, and I had a fabulous evening. By getting out of my head and cranking down the perfectionism, I danced better and had a lot more fun. But I could have just as easily have chosen option one and struggled through the evening. In the end, it came down to my own state of mind. Nothing more, nothing less. This is so fun to read. It must be the mysterious cheese ball. I also learn that I have a perfectionist approach in dancing which preventing me from connecting with my partner and having fun.